In Odessa, Ukraine, Daria, a whip-smart engineer, spends her days underemployed as a secretary—a job she was lucky to get in this rotten economy. She spends her evenings moonlighting as an interpreter at an agency that matches lonely American men with beautiful-but-broke Ukrainian women. She spends her nights wondering if there is more. When an American client offers marriage and a one-way ticket out of poverty, Daria jumps at the chance. She soon learns there's a reason that her husband couldn't find a wife in America, and that the grass isn't always greener on the other side of the world. The perfect book for anyone who's ever been stuck in a dead-end job or relationship, Moonlight in Odessa is an exploration of language, culture, and the difficult choices we make in the pursuit of love and stability. 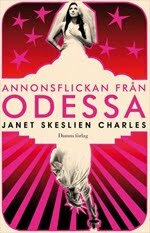 Joan: Moonlight in Odessa has it all—unique atmosphere, unpredictable plot, intriguing yet flawed characters. But one thing that struck me (while I was up until 4am finishing the novel!) was the pacing. I kept telling myself one more line, okay the next line, um, the one after that. I went back to try and figure out how you pulled that off. I’m still not sure—but I’m going to study it some more. Sentence structure? Dialogue? Please share your secret! Janet: I am so glad that you enjoyed the novel! One thing I tried to do in every chapter was to raise the stakes. Daria’s life is one big obstacle course – she has conflict at work, trouble with men, and is forced to make tough choices at an age where she doesn’t have the maturity or wisdom to understand the consequences. Yet, at any age, how do we know what the right choice is until we make it? Joan: Your introduction of wordplay into the narrative worked so well. Daria has studied English and finds great irony and wit in the differences between Odessans and Americans; she often interjects anecdotes and conjugated verb forms to prove her point. Even so, her perceptions and inner dialogue never strayed from advancing the plot. As a writer, I’m aware of the craft and attention that must have gone into assuring the wordplay didn’t bog down the narrative. Did you get resistance from agents or editors about this? Janet: Thank you for your kind words! Since Daria was a very reserved character, I used the verbs and comparisons as a way for her to express her excitement, worries, and fears. I didn’t get any resistance about the wordplay, but pacing was a big concern to me. Another manuscript I had worked on for years did not have tension or action until page fifty. In Moonlight in Odessa, it was important to find a way to begin the action from page one and to raise the stakes throughout the entire novel. Joan: An unexpected twist occurs when, despite Daria’s devotion to language, she overlooked a red flag. (I saw it at the time, but dismissed it!) I’ve been noticing a similar pattern in books with well-written characters: Sometimes a key strength undermines their ability to see the big picture. Was this intentional? Janet: It was intentional. When many of us fall in love, we see what we want to see in our partners. We dismiss anything that is not part of the script we have written in our heads. Daria wants to believe, so she does. I wanted to show how a smart, feisty woman can have her confidence stripped away, one putdown at a time. And I wanted to show that women can find the courage to leave and start over. Joan: Continuing our discussion on character, in an interview you said that in early drafts Harmon started with no redeeming qualities, yet he changed in ways you never expected. You wanted the reader to re-evaluate him after every chapter, wanted to make sure he evolved in a believable way. I gave great thought to his character as I was reading, so I think you achieved your goal. Harmon’s character is so real, it seems he had his own ideas of where the story would lead! Did you always know how it would end? Janet: I thought that the book would have a sad ending, because the cases I saw of foreign women who had moved to Montana to marry American men did not end well. Then I decided that the past doesn’t have to dictate the future. I wanted to show that it is possible to start over and that sometimes we have more friends and resources than we think we do. Joan: Daria’s revelation about her moonlighting job felt very believable. You’ve spent some time with the subject of mail order brides. (Or email order, as you refer to it the book!) Can you tell readers a bit about your experience? Janet: My aunt lived across the street from an Odessan who had married a Mormon. Both had children from first marriages. They lived on an Indian reservation in a town that had a population of 200 people in Montana. Quite a shock for a woman from a city of over a million inhabitants, a city on the sea full of theatres, cafes, and museums. Her American husband expected her to bow to his wishes; for example, he wouldn’t let her drink coffee because it contained caffeine. When I met her, she seemed so very sad. She had made this bargain for her children’s future. Her choice underlined the sacrifices we make for the people we love. I have done a lot of research and found that the one factor in a foreign woman’s happiness in a marriage to an American or Canadian man is location. Women who live in cities can take English as a Second Language classes, find work, and have friends of the same background. Women who live in rural areas are often more isolated and unable to work and are therefore dependent on their mates. It is estimated that 10,000 women who meet their husbands on international marriage brokers such as www.amorsi.com enter the United States each year on three-month K-1 Fiancé(e) visas. This means that they have three months to marry the man or they must return home. That is not a lot of time to make such an important decision. Joan: I was struck by how different the Odessan culture is—especially their pride, in particular Daria’s inability or unwillingness to share her feelings with those closest to her. Did you struggle with cultural differences during your stay? Janet: The first year I lived in Odessa was a time of culture shock. Everything was different – not necessarily better or worse, just different, from the way people approached food to their appearances. I think that Ukrainians had more balanced diets and did not follow fads such as the no fat or no carb or South Beach or North Pole diet. At the school where I worked from 1994-1996, boys had to wear suits while female students and teachers had to wear dresses or skirts. I only brought one dress and two skirts to Odessa – not enough to make it through the school year! My colleague wore a beautiful pantsuit and was chastised by the principal. On the other hand, the principal never had to deal with students wearing “lowrider” jeans. In two years, I never saw anything go to waste – not a scrap of food, a piece of material, or a yogurt container. Everything was used or had a second life. That was an important lesson. People were very kind and generous. I think Ukrainians are the best hosts in the world. I have never felt so welcomed and many people who have lived in the Ukraine say the same thing. But people were reserved, and it did take time before they would open up about their lives and families. My favorite coworker was ashamed of her apartment and would not tell me where she lived. Even when I left the country, she told me to write to her in care of her mother. 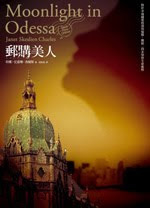 Joan: I enjoyed seeing all the various book covers on your website; the Taiwanese cover is especially stunning. Do you have a favorite? Janet: I agree that the Taiwan edition is stunning. The different artwork amazes me! The artists have done a brilliant job of conveying different elements of the book. I like the playing card cover of the Swedish edition. I also really like how the Icelandic cover mixes lace, a Russian doll, and a one-hundred dollar bill to show that international marriage organizations represent both romance and commerce. The Dutch covers bring out the darker elements of the story and for that I think that they are the strongest images. Joan: I understand your next book revisits Odessa. Will we see some of the same characters? Daria makes an appearance, right? Janet: Right now, I am working on a novel from Jane’s point of view – an exploration of Odessa and her friendship with Daria. I’d like to bring back some of the characters and show them in a different light. Will anyone read the book? I haven’t shown it to anyone yet. Joan: I’m copying one of your questions to me: What’s the best advice you’ve received? Thank you so much for taking the time to interview me. I am honored to be featured on What Women Write! Thanks Janet! 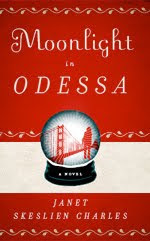 Readers, I'm betting you will love the characters in Moonlight in Odessa as much as I did! I enjoyed both of these interviews so much! I'm in the midst of reading Moonlight in Odessa and am enjoying it. Ironically, my husband and I picked up a random DVD at a used entertainment store several weeks ago called Two Brothers and a Bride with Emily Mortimer and David Arquette (and the main character, whose real name escapes me at the moment!). We watched it last weekend. It was about two brothers who go in search of a bride in Russia, including going to the socials, etc., just as you've described in the novel. Kind of a quirky dark comedy, but I was just marveling at the coincidence. Janet, thanks for finding What Women Write and contacting us for this fun exchange. Best wishes on all your future endeavors! Thank you for reading the interview! Hope that you will continue to enjoy the novel. I am so glad that we could do an interview exchange as I really admire the authors you feature and loved the Amy Einhorn interview. I saw that movie -- it was filmed at a real 'social' organized by A Foreign Affair (loveme.com).